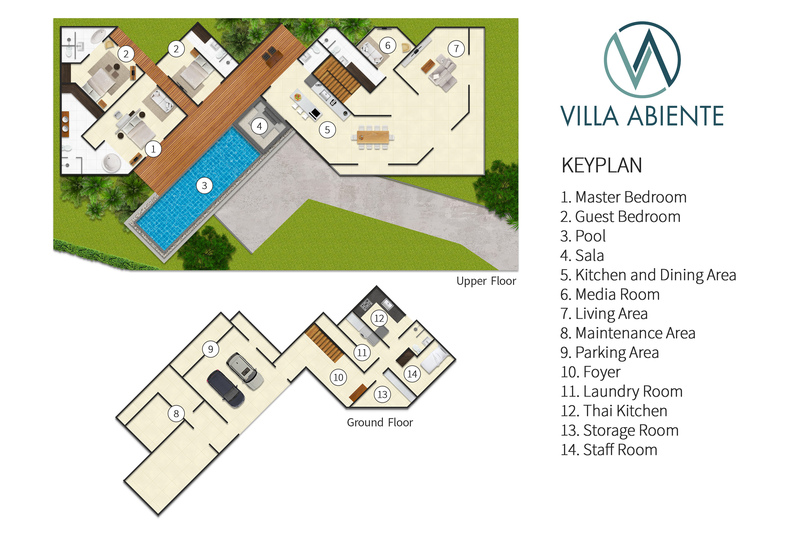 Villa Abiente’s ground-floor entry hall is adorned with a Zen pebble-garden and a mix of modern and traditional art, including a huge, eye-catching mural of an architectural sketch. Staff rooms and the chef’s kitchen are also located on this floor. Up the staircase and through an imposing double door is the main living area housing the guest kitchen, living room and dining area. Just behind the living room is the cosy media room. The living area opens widely to the pool, sun terrace and an outdoor lounge. Two of the villa’s bedrooms are arranged along the pool’s length, with the third tucked just behind. All three comfortable bedrooms at Villa Abiente have ensuite bathrooms, are furnished with queen-size beds and equipped with air conditioning, TVs and plenty of storage space. Villa Abiente’s master suite lies at the corner of the villa and features floor-to-ceiling glass doors that slide open to the pool terrace presenting fabulous sea and sunrise views. The master’s ensuite bathroom is fitted with a chic white tub for two and a dressing room. The guest bedroom next to the master suite also has sea views and a poolside setting, while the third bedroom offers a peaceful garden view and also features a double tub in its bathroom. Villa Abiente’s fresh white interiors contrast against the rich blues of the tropical sea and sky, to give the feel of a luxury yacht. The open-plan living spaces have an easy elegance, with the eight-seater dining table, guest kitchen, breakfast bar and lounge forming the heart of the villa. While the lounge is furnished with an inviting two-way sofa and TV, the media room just behind it offers a cosier setting for movie nights, and comes with its own bathroom and a sofa bed. A 12-metre infinity swimming pool bordered by a sundeck and a sunken lounge that makes the perfect setting for cocktails, assures relaxed tropical living at Villa Abiente. At ground level, a small lawn offers space to throw a Frisbee or set up the barbecue for a seafood feast.